The Explorer’s Way, aka the Stuart Highway, deserves its name! 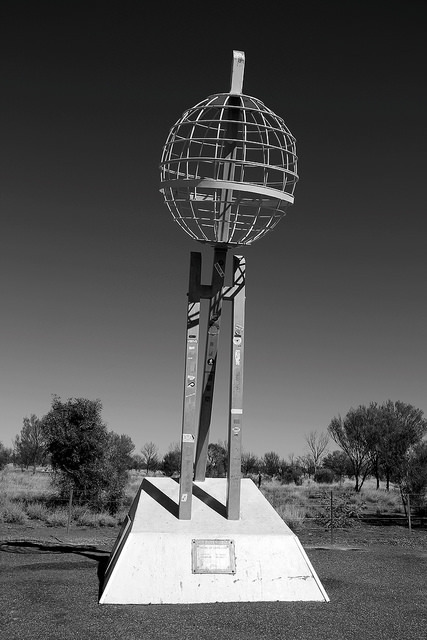 The Highway is named after John McDouall Stuart who, in 1862, became the first European man to successfully cross Australia from south to north and make it back alive. The journey itself was extraordinary considering he did this on foot. His expedition took nine months going north and another five months getting back to Adelaide. We did stretches of the Explorer Highway the last couple of years, last time we drove all the way from south to north. From time to time you drive for hours without seeing anything, except for the usual (dead) kangaroos and birds of prey. And you have to look out for wandering cattle, since a lot of (big) farms don’t have fences. John Stuart hoped to find a big inland sea, though no water could be found, only vast dry salt lakes and unfertile land … There are only a handful of towns along the road, but for the traveller-to-be there is no need to worry: every 200 km or so there is a roadhouse, where you can fill the car and have a refreshment, at most of these places you can sleep as well. Tip for the unexperienced driver: do not drive at night, at dawn or dusk: you don’t want your journey to be spoiled by hitting an animal …(and you see many roadkills along the road). And take care for the many road trains. 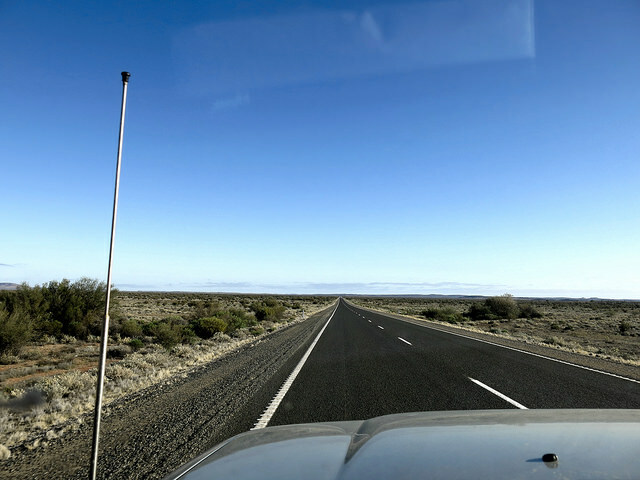 The Stuart Highway starts in Port Augusta, a transport hub, starting point for a visit to the Gawler Ranges, the Eyre Peninsula or the long straight way to Perth via the Nullarbor. From there on the road goes north, first real stop is Woomera, a strange little town, set up in 1947 as a military town. 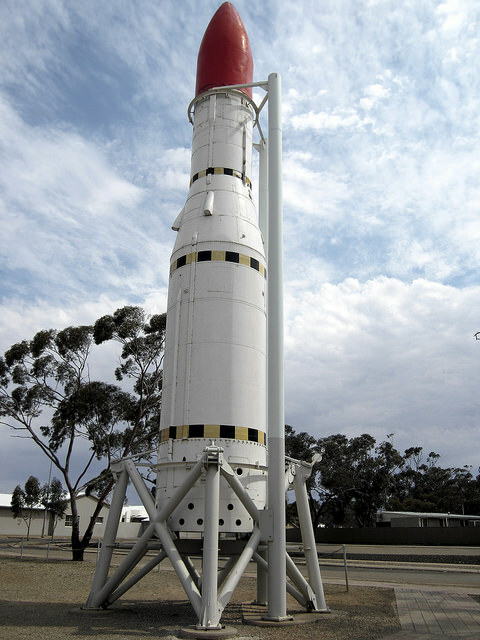 The land around the town is prohibited as it is still used by the Australian and American armies to test weapons and do space research. If you want to take a detour of the Stuart Highway you can try the Oodnadatta track. An unsealed and famous 4WD track from Marree to Oodnadatta that takes you along the biggest farm in the world (Anna Creek Station, has the size of Belgium) and Lake Eyre, a massive salt lake that can turn into a giant inland sea when it fills up (this only happened 5 times in the past 130 years, but two times in the recent past: 2009 and 2010). A necessary fuel stop there is William Creek (really the middle of nowhere). Driving further up north on the Stuart Highway, the flat landscape starts to change into white and ochre coloured hills, the sign you are approaching Coober Pedy. This town is all about opal and living underground. About 70% of the world’s opals are digged here. You better visit this place during the winter months (June-August), temperatures can rise to up to 50° Celsius in summer … Reason enough to go underground … Houses, hotels, caravan parks, churches and museums, you name it and you can find it under the ground! Just out of town are The Breakaways, a magnificent landscape of importance to the Aboriginal people and well worth a visit. This is also one of the places where you can have a close look at the Dog Fence, installed to protect the cattle and sheep from the dingoes and the largest fence in the world (spreading through 3 states and has a length of 2250km). The flat endlessly plains behind the fence are called the Moon plains, sight of Mad Max. Hitting further north and crossing the border between South Australia and the Northern Territory, the next town is Alice Springs, the first ‘real’ town since Port Augusta. You can just call it Alice, in the middle of the McDonnell Ranges, and the base of the Royal Flying Doctors. Don’t be surprised to see airstrips on the Stuart Highway, these are used by the Flying Doctors to reach remote towns or farms. Alice is also the base of heaps of tourists to explore the Red Centre, and visit Uluru. Just a few kilometres out of town you cross the Tropic of Capricorn … Strange to pass an imaginary line J Tropics are coming closer and so are the termite hills! One of the more remarkable stops is Aileron, just a quick stop to have a look at the giant statues. Another one is Wycliffe Well, the self proclaimed UFO capital of Australia, where there is nothing more than a roadhouse/caravan park and a few green little aliens. Nice photo opportunities! 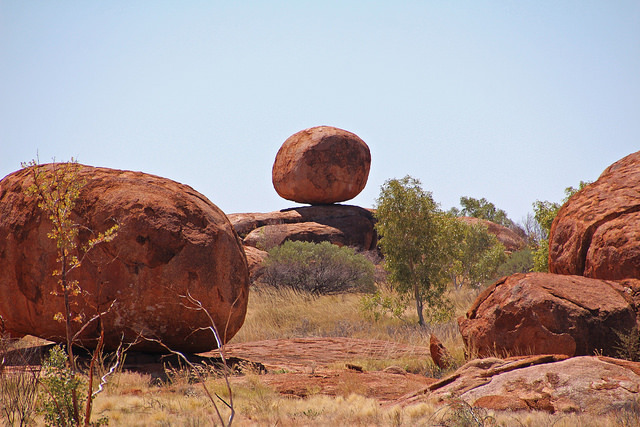 About 100 km south of Tennant Creek, you’ll find a strange natural formation: the Devils Marbles. Bigger and smaller granite boulders, many in the form of marbles. Once upon a time there must have been a huge granite rock. That mass broke down and erosion did the rest. For the Aboriginal people the Marbles have another meaning: they believe the boulders are the eggs of the Rainbow Serpent. One of the marbles was once used to put upon the grave of John Flynn, in Alice Springs. It took almost 50 years before the stone was returned to its rightful place. After all, the Devils Marbles, or Karlu Karlu in Aboriginal language, is a sacred place. You can stay here at a very basic camping site. From Daly Waters it is only a few hundred kilometer to the end … An interesting stopping place is Larrimah. This used to be an important depot during the Second World War, and there are quite a bit remnants referring to that period. Till the 70s Larrimah was the stop of the NT Railway line from Darwin. 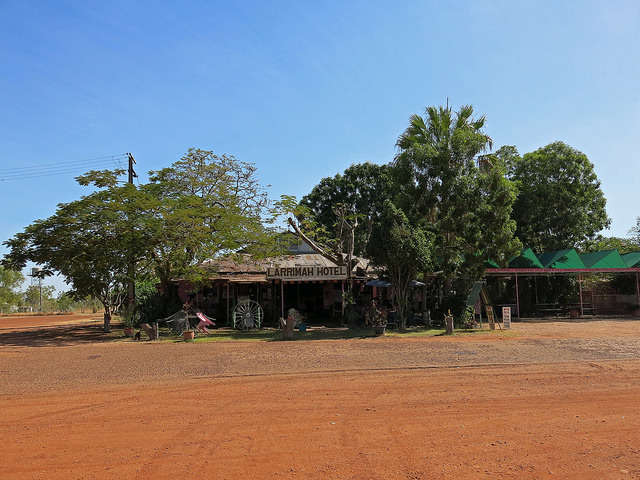 But perhaps Larrimah is best known for its pub/hotel (/zoo) with the highest bar in the NT. Next stop: Mataranka, known for the natural hot springs and they are safe to swim! And along the road huge statues represent parts of the classic Australian storybook “We of the Never Never”. About 106 km north, Katherine is the second biggest town in the Northern Territory, the birth place of cyclist Cadel Evans – Amazing to see how someone becomes a champion, being born in a place like this … – and a gateway to explore Nitmiluk National Park (Katherine Gorge), Edith Falls, Kakadu National Park, Litchfield National Park or to do a crocodile cruise. explorer’s way from Travel for Motion on Vimeo.